This article is about the railway station. For the adjacent subway station of the same name, see Union station (TTC). "Toronto Union Station" redirects here. For other uses, see Toronto Union Station (disambiguation). Union Station is a major railway station and intermodal transportation hub in Toronto, Ontario, Canada. It is located on Front Street West, on the south side of the block bounded by Bay Street and York Street in downtown Toronto. The City of Toronto owns the station building while the commuter rail operator GO Transit owns the train shed and trackage. Union Station has been a National Historic Site of Canada since 1975, and a Heritage Railway Station since 1989. It is operated by the Toronto Terminals Railway, a joint venture of the Canadian National Railway and Canadian Pacific Railway that directs and controls train movement along the Union Station Rail Corridor, the largest and busiest rail corridor in Canada. Its central position in Canada's busiest inter-city rail service area, "The Corridor", as well as being the central hub of GO Transit's commuter rail service, makes Union Station Canada's busiest transportation facility and second-busiest in North America, serving over 250,000 passengers a day. More than half of all Canadian inter-city passengers and 91% of Toronto commuter train passengers travel through Union Station. Via Rail and Amtrak provide inter-city train services while GO Transit operates regional rail services. The station is also connected to the subway and streetcar system of the Toronto Transit Commission (TTC) at its adjacent namesake subway station. GO Transit's Union Station Bus Terminal, across Bay Street from the station building, is connected by the trainshed. The Union Pearson Express, the train service to Toronto Pearson International Airport, platform is a short walk west of the main station building, accessible by the SkyWalk. Union Station is located on Front Street between York and Bay Street. Toronto's Union Station is located at 61 Front Street West, between Bay and York Streets in Toronto's business district, with Toronto's entertainment district beginning across Bay Street. It is roughly at the city's east-west centre. It is also close to Lake Ontario, which marks Toronto's southern boundary. The southernmost part of the Gardiner Expressway, which lies between Union Station and Lake Ontario, provides easy core access to GO Transit buses. Union Station's columned façade and main entrance faces north, towards downtown Toronto. The Fairmont Royal York Hotel, a former railway hotel, is directly across Front Street from Union Station and can be accessed from the station both at street level and underground via the PATH. The Dominion Public Building, another building from the same era, is just to the east of the station, at the corner of Front and Bay Streets. Other major buildings near Union Station are Telus Tower and Brookfield Place. Brookfield Place is home to the Allen Lambert Galleria, a six story high pedestrian thoroughfare, as well as the Hockey Hall of Fame, which holds the Stanley Cup. The Scotiabank Arena, Rogers Centre, Metro Toronto Convention Centre, and the CN Tower are all close by, and can be seen from some parts of the station. Like Union Station, these structures were built on former Railway Lands. All of them can be accessed directly from Union Station via the Skywalk. The land around the CN Tower has been converted to a public park. Toronto's Union Station is Canada's largest and most opulent railway station. The Montreal architecture firm of Ross and Macdonald designed the building in the Beaux-Art style as a joint venture between the Grand Trunk Railway and the Canadian Pacific Railway, with help from CPR architect Hugh Jones and Toronto architect John M. Lyle. In 1975, the Historic Sites and Monuments Board of Canada cited its design as being of "national architectural significance as one of the finest examples of Beaux-Arts railway station design in Canada". The bilaterally symmetrical building comprises three connecting box masses facing Front Street West, with the main structure in the middle. Together, the three parts measure 752 feet (229 m) long and occupy the entire south side of the block between Bay Street in the east and York Street in the west. The facade of the Front Street entrance includes 22 colonnaded loggia constructed with limestone. The exterior Front Street façade is laid out in an ashlar pattern, constructed with smooth beige Indiana and Queenston limestone. The colonnaded loggia which faces Front Street features 22 equally spaced Roman Tuscan columns made from Bedford limestone, each 40 feet (12 m) high and weighing 75 tons. Fourteen three-storey bays, each with severely delineated fenestration, form the façade on either side of the central colonnade for a total of 28 bays. The structures at either end have an additional ten bays. Three rectangular windows fill each bay, lighting the interior hall with plenty of natural light. However, the building's external profile is hard and flat, with a line of huge columns, heavy ornamentation and strong symmetry. The recessed main entrance is framed by two sets of four columns, with relief wreaths carved into the entablature above the columns. These columns are composed of three separate segments on top of an incongruous octagonal plinth, implying an Ionic order or Corinthian order; however, the capital is sculpted in a Doric order. Consequently, these columns appear to be unfinished. The original plan for the columns is not known. A wraparound dentil cornice and a recessed peaked hipped roof creates the illusion of a flat roof, just like a palazzo. On either side of the main entrance, a blind arch with an ornamental keystone contains a set of three steel-framed doors, along with a large arched window. Decorative friezes separate the arched window from the doors. When these entryway elements are combined, they create a processional experience through the entryway into the grand interior space. The flat-roof illusion, together with the axial symmetry, classical detailing in both structural and decorative elements, heavy ornamentation, and formal setting is typical of the Beaux-Arts style. The station housed a gun range on the seventh floor from 1927 until 2008. The range was operated for "Canadian Pacific Railway and Canadian National Railway police to practice their shooting skills. It eventually opened to members of the public". It was known as the Canadian National Recreation Association (CNRA) handgun club. The city closed the range in 2008 in an effort to reduce gun violence. The front entranceway opens on to the expansive Ticket Lobby, informally known as the "Great Hall". This part of Union Station runs the entire length of the main section. It is 250 feet (76 m) long and 88 feet (27 m) high at its highest point. Like the outside facade, enduring materials such as bronze, limestone, marble, tiles, and translucent glass create a sense of enduring quality. Union Station's Ticket Lobby, or "Great Hall", is lit with diffused natural light from clerestory windows throughout the lobby. The entire space is lit with diffused natural light from clerestory windows refracted throughout the lobby. Each end of the Great Hall also features four-storey tall arched windows, based on those of Roman baths. The two-storey-high vaulted ceiling, which is what makes it look from the front as though a second building were rising behind the colonnade, is made of coffered Guastavino tiles. The walls are faced with Zumbro stone from Missouri, and the floors are constructed of Tennessee marble laid in a herringbone pattern. Below the cornice surrounding the "Great Hall" are carved the names of many Canadian destinations, from the east coast to Vancouver, accessible by the Grand Trunk Railway or Canadian Pacific Railway at the time of the station's construction. Many remain destinations on Via Rail routes. Via Rail's ticket, baggage, and information counters are in this space, mostly lined against the north wall. (Via Rail ticket agents also handle all ticketing sales and baggage services for Amtrak.) Small restaurants and other stores line the opposite wall. The main clock and the main departures board are in the centre of the space. Stairwells at either end of the hall lead to the arrivals area one floor below and connect to urban transit. Benches are near the stairwells for passengers and those meeting them, although most prefer to wait in the departure area, down the large ramp in the centre of the south wall. The departure area is a large, wide space under the tracks. The area holds the largest seating areas, as well as lounges for Via 1 passengers. Seventeen gates line the east and west walls of the departure area, each with escalators going to track level. Stairways at the ends of the "Great Hall" lead to the Arrivals Concourse Via Rail and Amtrak use for inter-city train passengers, as well as GO Transit concourses, TTC subway and streetcar and the PATH pedestrian tunnel network. Connections with GO Transit services can be accessed through the York Concourse. Passengers can connect with GO Transit services through the 62,000 sq ft (5,800 m2) York Concourse, which opened on April 27, 2015, west of Union Station. This new concourse supplemented the York South Concourse that provided access to platforms 24 to 27. The York and York South Concourses connect to the York East Teamway, as well as an entrance to a PATH tunnel leading across Front Street, between York Street and University Avenue. The York West Teamway is connected to Union Station via the Skywalk. Historically, the 40,000 sq ft (3,700 m2) Bay Street Concourse was the hub of GO Transit operations for almost 40 years. The Bay Concourse closed on August 16, 2015 for approximately two years while it undergoes revitalization. The Bay West Teamway is open as it too undergoes revitalization, providing access to platforms 3 to 13 and the Bay South Concourse. The Bay East Teamway provides access to platforms 3 to 13, and is connected to the Union Station Bus Terminal. Trainsheds at Union Station. A glass atrium was constructed at the central portion of the trainshed. Trains arrive and depart from the train shed, which contains 23 platforms (11 island platforms and one side platform) south of the Great Hall. The train shed was designed by A.R. Ketterson, and built in 1929-1930. It is a variation of the Bush train shed invented by Lincoln Bush. A reconstruction of the trainshed began in January 2010. The east and west sides of the shed, totalling approximately 30,000 square metres (320,000 square feet), are being renovated and restored with input from Parks Canada to help preserve its heritage character. This renovation will also see a green roof installed, reducing the urban heat island effect and stormwater runoff. The central portion of the original trainshed, totalling 30,000 square metres (320,000 square feet), was removed and replaced with a glass atrium. The structure floats above the tracks, and allows daylight to reach the platforms. Most Toronto-area railway freight does not enter downtown Toronto. Local freight movements are permitted on two dedicated tracks south of the train shed, allowing freight trains to go east towards Pickering, and west towards Burlington. Union Station's west wing is west of the Great Hall. Metrolinx is headquartered in the west wing at 97 Front Street. Across from these offices is an official tourism information centre that provides maps, visitor guides, brochures and tourism specialists to provide help to city visitors. A pathway known as the SkyWalk continues west from the west wing, overtop of York Street. The SkyWalk is considered part of the PATH network, and connects Union to the CN Tower and the Rogers Centre (SkyDome). It is also the location of the Union Pearson Express station. Toronto's third and current Union Station was constructed between 1914–1920 by the TTR. Prince Edward, Prince of Wales officially opened it to the public on August 6, 1927, in a lavish ribbon cutting ceremony using a pair of gold scissors. In attendance were Prince George, Lieutenant Governor of Ontario William Donald Ross and his wife, Prime Minister of Canada William Lyon Mackenzie King, Prime Minister of the United Kingdom Stanley Baldwin and Mrs. Baldwin, Premier of Ontario George Howard Ferguson, and many other members of the Government of Ontario and Government of Canada. Toronto's second Union Station several years after its opening in 1878. The current Union Station's history can be traced to 1858, when the Grand Trunk Railway (GTR) opened Toronto's first Union Station west of the present Union Station. The wooden structure was shared with the Northern Railway and the Great Western Railway. This structure was replaced by a second Union Station on the same site, opening in 1873. The Canadian Pacific Railway began using the facility in 1884 and it was completely rebuilt, opening in 1896. The Great Toronto Fire of 1904 destroyed the block south of Front Street West, immediately east of the second Union Station (bounded by Bay and York streets), but did not damage the station. The GTR acquired this land east of the second Union Station for a new passenger terminal and in 1905 both the GTR and the CPR decided to proceed with the design and construction of a third union station. Excavations for the third Union Station in 1915, with second Union Station in background. The decision to undertake the third union station was made against a backdrop of significant change in the Canadian railway industry. At the same time, the Government of Canada was encouraging the GTR to build a second transcontinental railway (what would become the Grand Trunk Pacific Railway and the National Transcontinental Railway) and the Canadian Northern Railway was undertaking an aggressive expansion across the prairies and into southern Ontario. On July 13, 1906, the Toronto Terminals Railway (TTR) was incorporated to "construct, provide, maintain and operate at the City of Toronto a union passenger station". The TTR was jointly owned by the GTR and the CPR who each held 50% of the TTR shares. The TTR supervised construction of the new station which began in 1914 and proceeded to 1920, having faced significant delays in the shortage of construction material and workers as a result of the First World War, as well as the GTR's deteriorating financial position due to its ill-fated transcontinental GTPR railway project. The resulting construction saw the elimination of Lorne Street located between Simcoe and Bay from Front to Esplanade with tracks leading west of the new station now in place. Although the new station's headhouse and east and west office wings (the station building visible from Front Street West) were completed in 1920, it did not open to the public for another seven years until the system of approach tracks were designed and implemented by the TTR and its owners. During this time in 1923, the bankrupt GTR was fully nationalized by the Government of Canada and merged into the Canadian National Railways (CNR), which would assume the GTR's 50% ownership of the TTR and thus the third Union Station. The station was opened in August 1927 by Edward, Prince of Wales. Although the station was incomplete, its building was complete and the station was opened on August 6, 1927 by the Prince of Wales. Four days later, the track network was shifted from the second Union Station. To get to trains, passengers would walk from the south doors to the tracks located several hundred feet to the south while the new viaduct, concourse and train shed was under construction. Demolition of the second Union Station began almost immediately and was completed in 1928. The third Union Station project was not fully completed until 1930 when the train shed was completed; its construction was supervised by the TTR from 1925–1930. The TTR also constructed a central heating plant at the corner of York and Fleet streets (now Lake Shore Boulevard West) to replace the original Toronto Hydro plant on Scott Street which had been expropriated by the TTR to build the approach track viaduct to the new station. It was fuelled by coal delivered by a CNR siding and was the largest such facility in Canada when it opened in 1929; it produced 150,000 kg/330,000 pounds of steam per hour and 270 million kg/600 million pounds annually to heat the station, the passenger cars in the train shed, CNR and CPR yard facilities in the area now occupied by the Gardiner Expressway, Rogers Centre and Scotiabank Arena, the CPR's Royal York Hotel, the Dominion Public Building, the federal post office building adjacent to the station and the CN/CP Telecommunications building on Front Street. Excavation outside of Union Station on Front Street in 1950 for a subway line. 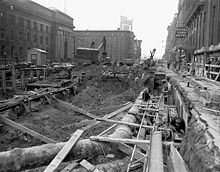 The first major change to Union Station took place in 1954 when the Toronto Transit Commission opened its Union subway station adjacent to Union Station but buried beneath Front Street West. This subway station acted as the southern terminus of its new subway line. The subway station included a direct tunnel connection to the lower level passenger concourse. This passageway was closed and replaced by the direct connection between the railway station and the subway station in 1979 when the subway station mezzanine was renovated and enlarged. In 1990, the TTC's Harbourfront LRT project added an underground streetcar loop now used by the 509 Harbourfront and 510 Spadina streetcar lines. TTC passengers using the Union subway and streetcar station may transfer between both modes without entering the Union Station proper. During the early 1970s, Canada's two major passenger railways, the Canadian Pacific Railway and Canadian National, were reducing their services to the bare minimum mandated under the Canadian Transport Commission, largely as a result of unsustainable losses resulting from increased competition in new subsidized four-lane highways and airports. Construction for the CN Tower in 1973. Plans to redevelop the Railway Lands surfaced with freight traffic being diverted outside the downtown core. The third Union Station's future was looking bleak by 1972 when both railways sought to increase return on their underutilized waterfront rail classification yards which was being viewed as valuable real estate. Both CN and CP began to abandon their extensive waterfront rail classification yards south of the passenger station to make way for urban redevelopment. The Gardiner Expressway project was constructed over part of the railway property and CN had proposed constructing a telecommunication tower (what would become the CN Tower later that decade). CN and CPR proposed a "Metro Centre" development on the south side of Front Street on the site of Union Station and proposed to demolish the structure (which was costing an increasing amount of property taxes but not bringing in revenue). The proposed Metro Centre development was strikingly similar to what occurred with New York City's Penn Station and would have consisted of an underground fourth Union Station (the terminal trackage would have been buried), a convention centre, a telecommunications tower, along with complementary office and retail developments. Local opposition to the proposal was successful in having the city council's decision to support the Metro Centre development overturned and Union Station was saved. In 1978, CN and CP transferred responsibility for their passenger rail services to Via Rail, a new federal crown corporation; however, CN and CP retained their 50% ownership shares of the TTR. The SkyWalk was constructed over the train tracks of Union Station to connect the Metro Toronto Convention Centre and Rogers Centre with the rest of the PATH pedestrian network. The GO Transit commuter rail agency which was established on May 23, 1967, had been undergoing unprecedented expansion which was seeing Union Station see passenger levels that outstripped some of the busiest airports in the world. The consolidated TTR trackage included a flyover west of the station to permit freight trains to cross CN's Oakville subdivision without blocking GO Transit's commuter trains. The flyover was constructed in 1982-83 and also allowed GO trains destined for the CN Weston subdivision to cross over the tracks used by GO and Via trains using the CN Oakville subdivision. The CN Tower had revamped the vision of Toronto's waterfront rail yards and proposals were made to construct what would later become SkyDome (1989) and Air Canada Centre (1999), resulting in further changes to the Union Station trackage. The PATH pedestrian tunnel network was built to connect Union Station's passengers with many of the downtown office towers and the SkyWalk was constructed over the terminal trackage west of the station to connect the PATH with the Metro Toronto Convention Centre and Rogers Centre. In 2000, the City of Toronto purchased the station building from the TTR, while GO Transit purchased the railway corridor and the Union Station train shed. On July 24, 2003, the City of Toronto agreed to lease Union Station to Union Pearson AirLink Group, a subsidiary of SNC-Lavalin, for a term of 100 years. A subsequent announcement on May 24, 2006, addressed several issues for commuters including: constructing a direct connection from the GO Concourse to the PATH pedestrian tunnel system, a new eastbound platform for the Union TTC station, improved access to streetcars at Union TTC station, and improved capacity for inter-city railway passengers. These developments were part of a $100 million initiative announced by the city and its transit authorities, along with the Government of Ontario and Government of Canada. On August 5, 2009, the Toronto City Council approved an update of this plan which was projected to cost $640 million, with construction lasting from 2010 to 2014. Much of the work was undertaken by or managed by Carillion. Union Station's southern entrance was opened in 2010. Renovations of the station's train sheds may be seen in the background. The work also involved a complete overhaul of the GO concourses, deepening them to create two storeys of space. The lower storey will provide retail space and room for pedestrian traffic flow, and the upper storey will be dedicated to passenger traffic onto the platforms. This will expand not only the current GO concourse in the east of the building, but also open up the western end; GO Transit's presence in the building will nearly quadruple. Additional aesthetic points include glass roofs over the moat space around the north sides of the building, and a tall atrium over the central portions of the platforms. A new southern entrance, adjacent to the Air Canada Centre, opened in 2010. The 2009 Ontario and Canada government budgets included financing to assist GO, Via and the city in redeveloping and restoring the station. Track has been upgraded with better signals and snow cleaning devices to reduce winter delays to train movement. In 2016, it was realized that the renovated train shed roof was too low to allow electrification. The train shed roof is considered a heritage feature and cannot be removed. Remedies considered were raising the roof, or lowering the track level. In March 2019 it was reported that Vaughan-based contractor Bondfield Construction had applied for bankruptcy protection under the Companies’ Creditors Arrangement Act (CCAA). Union Station became designated as a National Historic Site of Canada in 1975, and a Heritage Railway Station in 1989. In 1999, Union Station was inducted into the North America Railway Hall of Fame as being significant in the course of railway history. The station is recognized as part of the Union Station Heritage Conservation District (Designated Part V) under the Ontario Heritage Act enacted by Toronto City Council on July 27, 2006. Timetable for inter-city rail services in the Great Hall. Union Station is the busiest public transportation structure of any kind in Canada, including air travel. It handles 65 million passengers annually, with an average of 200,000 passengers each day. Approximately two-thirds of those passengers are GO train or GO bus commuters, while another 20 million take the subway. The remainder are intercity travellers between other cities in Canada and the United States. Toronto is Canada's primary passenger train hub. Consequently, Union Station is Via Rail's most-used facility. Each year, 2.4 million Via Rail passengers pass through Union Station, representing more than half of all Via Rail passengers carried systemwide. This heavy usage is partly due to Union Station's position at the centre of Canada's busiest inter-city rail service area, the "Corridor", which stretches from Quebec City in the east to Windsor in the west. Via Rail train waiting in Union Station. The station is Via Rail's most used facility. Westbound Via Rail trains from Toronto connect directly to most major cities in Southwestern Ontario, including Kitchener, London, Sarnia, and Windsor. Additionally, westbound trains from Montreal pass through Toronto en route to Burlington. Northbound and eastbound Via Rail trains from Toronto primarily serve the heavily travelled Ottawa–Montreal-Toronto triangle. At Montreal, passengers can connect to trains heading to the Maritimes or north to the Laurentians. Union Station is also the eastern terminus of The Canadian, Via Rail's transcontinental service westbound to Vancouver. The Maple Leaf departing from Union Station to New York City. In partnership with Via Rail, Amtrak runs the Maple Leaf train from Toronto to New York City. An Amtrak crew takes over from the Via Rail crew at Niagara Falls, Ontario. The train switches to electric mode at Albany and collects power from a third rail. Other major U.S. destinations along the route include Buffalo, Rochester and Syracuse. Amtrak and Via Rail formerly operated the International Limited from Toronto to Chicago via the Sarnia–Port Huron border crossing, until it was cancelled in 2004. Both VIA Rail and Amtrak maintain service along the route on their respective sides of the border, but the trains do not cross the border. GO Transit trains at Union Station. They provide commuter rail services for the Greater Toronto Area. Union Station is the central terminal for GO Transit, who handled approximately 69.5 million passengers in 2015. GO Transit's Union Station Bus Terminal is located at 141 Bay St., S. of Front St., adjacent to the railway station. The station includes access to the Toronto subway system. Union Station is connected to the Toronto Transit Commission's Union Subway Station, which is part of Line 1 Yonge–University of the Toronto subway system. Two Toronto streetcar routes, 509 Harbourfront and 510 Spadina, can also be accessed underground without leaving Union Station. The streetcar platform was built in 1989 and is separate from the subway station platforms built in 1954. Altogether, twenty million TTC passengers pass through Union Station each year. The TTC station was remodelled in 2015. Toronto Transit Commission bus routes 6 Bay, 72 Pape, 97 Yonge and night route 320 Yonge, use curbside stops on the streets outside. On June 6, 2015, the Union Pearson Express (UPX), a dedicated airport rail link service, started running between Union Station and Toronto Pearson International Airport, stopping only at Bloor and Weston GO stations. The opening of the line allowed Metrolinx to achieve its goal, announced in 2010, of operating an airport rail link from Union Station in time for the 2015 Pan American Games. Union Pearson Express Union Station, located west of the main Union Station building. Trains on this line do not stop at the regular platforms used by GO and Via trains, but use a separate station located west of the main station building along the length of the main atrium of the SkyWalk between York Street and Lower Simcoe Street. The UP Express Union Station is a 5-minute walk from Union subway station. Trains depart from the station's single side platform every 15 minutes. Passengers access trains directly from an enclosed waiting area, and a glass wall with sliding doors separate trains from the platform and open to allow passengers to board directly from the waiting area without exposure to the elements. The floor of the waiting area is level with the train floor, which allows for step-free boarding. The UP Express Union Station has a dedicated customer service counter, ticket vending machines and flight check-in kiosks. These kiosks permit check-ins for Air Canada and WestJet. Three stands in the waiting area offer Balzac's coffee, souvenirs and Mill Street Brewery draft beer. The Northlander provided a passenger train service between Union Station and Northeastern Ontario from 1976 until 2012. In March 2012, the Government of Ontario announced plans to discontinue this service, and the final day of operations was September 28, 2012. The International (known until 1983 as the International Limited) provided a passenger train service between Union Station and Chicago Union Station from 1982 until 2004, when the cross-border service was discontinued and replaced by Via Rail's Toronto-Sarnia service, and Amtrak's Blue Water route from Port Huron to Chicago. The final day of operations was April 23, 2004. ^ Union Station. Directory of Federal Heritage Designations. Parks Canada. Retrieved October 23, 2013. ^ Union Station (Canadian Pacific and Grand Trunk) National Historic Site of Canada. Canadian Register of Historic Places. Retrieved August 19, 2011. ^ Union Station. Canadian Register of Historic Places. Retrieved October 23, 2013. ^ a b c d "About Union Station". City of Toronto. Archived from the original on August 11, 2015. Retrieved August 14, 2015. ^ "Info to GO" (PDF). GO Transit. April 2015. Archived from the original (PDF) on May 8, 2016. Retrieved April 26, 2016. ^ a b "Union Station". Union Pearson Express. June 9, 2015. Retrieved June 9, 2015. ^ Toronto Terminals Railway (November 2007). "Union Station design and architecture". Archived from the original on September 25, 2007. Retrieved November 24, 2007. ^ a b c d "Union Station Revitalization — Get on Board!" (PDF). City of Toronto. Retrieved August 14, 2015. ^ "HistoricPlaces.ca". HistoricPlaces.ca. August 28, 1989. Retrieved June 11, 2012. ^ Daniel Kitts (September 24, 2015). "Battle over Union Station shooting range underlines urban gun divide". TVO. Retrieved September 30, 2017. ^ a b "GO Concourse Improvements". Archived from the original on July 6, 2015. Retrieved August 5, 2015. ^ a b c d "Union Detailed Map". Go Transit. Archived from the original on September 24, 2015. Retrieved August 14, 2015. ^ "PATH map" (PDF). City of Toronto. Archived from the original (PDF) on August 20, 2015. Retrieved August 14, 2015. ^ "Your GO Train Platform at Union Station is Changing" (PDF). GO Transit. April 2015. Archived from the original (PDF) on September 24, 2015. Retrieved August 14, 2015. ^ a b "Bay Concourse Closing". GO Transit. Archived from the original on August 15, 2015. Retrieved August 14, 2015. ^ "Train Shed Roof Revitalization". GO Transit. August 14, 2015. Archived from the original on July 6, 2015. Retrieved August 14, 2015. ^ "Contact Us". Metrolinx. Retrieved August 14, 2015. ^ "Union Station Tourist Information Centre". City of Toronto. Archived from the original on August 11, 2015. Retrieved August 14, 2015. ^ Filey, Mike (August 2007). "Union Station turns 80". Toronto Sun. Archived from the original on September 30, 2007. Retrieved November 24, 2007. ^ a b c Toronto Terminals Railway (November 2007). "Toronto Terminals Railway history". Archived from the original on October 23, 2007. Retrieved November 24, 2007. ^ a b Riddell 1994, p. 14. ^ James Cowan (December 20, 2006). "Failed projects To Get Second chance". National Post. ^ Brodie Fenlon (August 5, 2009). "Toronto approves Union Station makeover". The Globe and Mail. p. A6. ^ Robyn Doolittle (May 26, 2014). "Over budget and behind schedule, Toronto Union Station project may miss Pan Am games deadline". The Globe and Mail. Toronto. Retrieved September 1, 2015. ^ "Union Station" (PDF). Retrieved January 20, 2018. ^ "New South Platform – Platform 26/27". GO Transit. Archived from the original on July 9, 2016. Retrieved July 19, 2016. ^ Gee, Marcus (January 28, 2016). "Raise the roof? Union Station reno runs into problem: New trains won't fit". www.theglobeandmail.com. Retrieved April 3, 2018. ^ Spurr, Ben (January 19, 2018). "Union Station renovation delayed again, will cost $23M more". www.thestar.com. ^ Morris, Siobhan (March 1, 2019). "UNION STATION RENOVATION COULD STRETCH INTO 2020". Newstalk 1010. Retrieved March 10, 2019. ^ Wilson, Codi (February 28, 2019). "Fire code violations laid after overcrowding situation at Union Station". CTV News Toronto. Retrieved March 10, 2019. ^ CNGRPsite (March 8, 2019). "As it files for creditor protection, Bondfield Construction wins right to defamation trial against Globe and Mail". Ontario Construction Report. Retrieved March 10, 2019. ^ "Heritage Property Detail". City of Toronto. 2015. Retrieved November 14, 2015. ^ "Info to GO" (PDF). GO Transit. September 2016. Archived from the original (PDF) on November 7, 2016. Retrieved November 7, 2016. ^ "Railway Gazette: Toronto airport rail link negotiations collapse". Retrieved August 16, 2010. ^ "Guest Services – FAQs". Union Pearson Express. June 8, 2015. Retrieved June 8, 2015. ^ Robin Levinson King Staff Reporter (June 6, 2015). "Union Pearson Express (UPX) opens to the public". Toronto Star. Retrieved June 8, 2015. Riddell, John (1994). The Railways of Toronto, Volume Two. 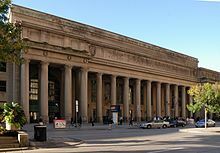 Wikimedia Commons has media related to Union Station (Toronto). Gee, Marcus (January 28, 2016). "Raise the roof? Union Station reno runs into problem: New trains won't fit". The Globe and Mail. Retrieved October 4, 2017.